Fully Renovated - All Brand New - Complete One Bedroom, One Bath with Full Kitchen Downstairs, under owner's home. Oceanfront on the beach. Heat & air. Everything is furnished except for food and beach towels. 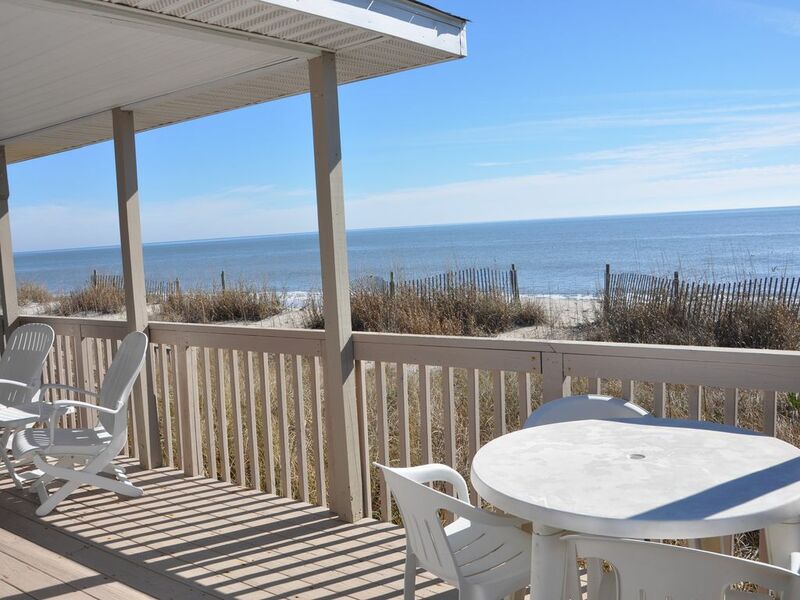 Renters have use of large deck upstairs direct Oceanfront less than 10 steps to the beach. Part of Deck is covered. Sleeps Two adults only, NO SMOKING, NO PETS. Twin beds can be combined into King, just ask. You cannot see the Ocean from within the apartment but can on the deck - just 25 steps to the Ocean from the Apartment. Always quite and very clean. We have owned this property for most of my life and love Edisto. The ocean can rock you to sleep at night! Great location and host very helpful. Oceanfront is true but misleading as apartment is basically basement with several small windows (1 cracked). Can walk around back, just steps from beach. Apartment very small/outdated. Bathroom tiny but functional. Apt generally dark and not sure if bedbugs in bed or fleas in couch but itchy wheals after I think sitting on couch. Plus: location, location. Very convenient to get around. Obviously not crowded in April. Was perfect until we had to evacuate! The apartment is perfect! Just steps away from the beach. Hurricane Florence cut our trip short but you can't predict mother nature! The is sweetest lady and I look forward to renting from her in the future. Sweet beachfront apartment at Edisto! This was a “me” week at Edisto and it couldn’t have been better! The location was perfect, the apartment was well appointed and very clean. The internet and cable is an added bonus as well as the use of the owners porch overlooking the beach. I look forward to staying again and enjoying everything that is Edisto! Thanks for your great review. We enjoyed meeting you. If you’re looking for a quiet place in a community that’s not commercialized this is the perfect spot! The cottage is right on the beach and the view is amazing! The owners are wonderful, very hospitable. A place to get refreshed & renewed! We enjoyed meeting you and glad you liked Edisto Beach. Enjoyed our stay. It was as advertised. Nice little beach apartment, clean, great views from the porch. The owners were very friendly.